You&apos;ve found "the one." You&apos;ve bought the ring. Now all you have to do is plan the perfect spot to ask that million-dollar question. 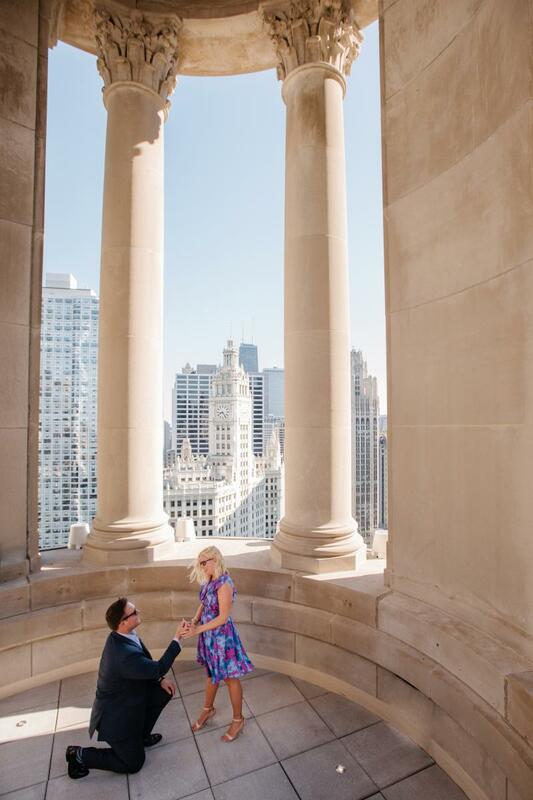 In Chicago, you&apos;re spoilt for choice when it comes to romantic backdrops. Here are just a few of our very favorites. Escape to a beautiful hidden garden where the sound of a gentle waterfall creates a supercharged aura of romance. 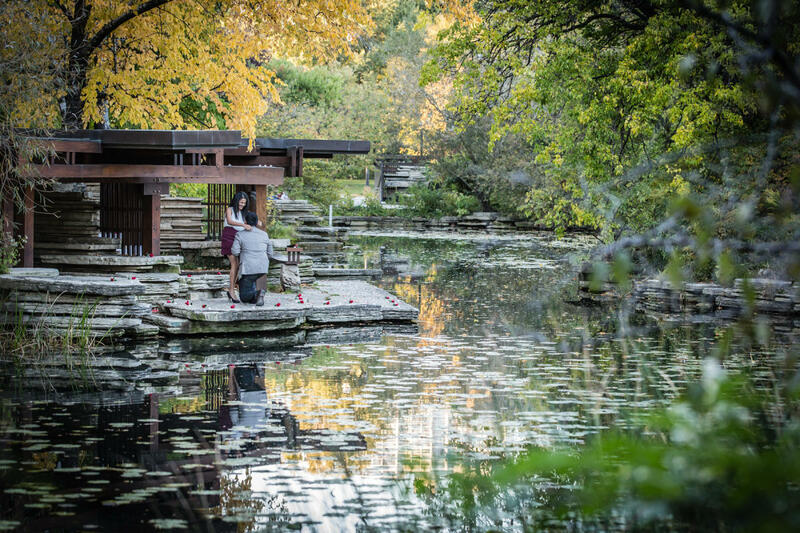 Follow the stone walk encircling Lincoln Park’s Lily Pool, created between 1936 and 1938, and you’ll discover a Prairie Style pavilion designed by landscape architect Alfred Caldwell. His goal in creating this oasis of tranquility was to mimic a river meandering through a serene prairie — and he succeeded. He describes it as “a cool, refreshing, clear place of trees and stones and running water.” This gem, located at 125 W Fullerton Parkway (between Stockton and Cannon Drives), is designated a Chicago Landmark, and listed on the National Register of Historic Places and as a National Historic Landmark. It doesn&apos;t get much more romantic than a city skyline view to the west and beachfront views over Lake Michigan to the east. Added to that, it&apos;s easy to seek out a little privacy. “It’s long enough to choose the perfect spot to distance yourself from the crowds,” says Chicago-based photographer, Alicia M. Fierro. “There is also a slightly elevated spot in the sand that makes for a beautiful backdrop." You&apos;ll find this sandy oasis at 1600 N Lake Shore Dr. The luxury lifestyle hotel LondonHouse Chicago, located on the riverfront, is one of the trendiest spots to soak in 360-degree views of the city. Best of all, there&apos;s a classically inspired Cupola on the rooftop, with towering Corinthian columns that are simply breathtaking. To ensure an intimate moment, LondonHouse Chicago offers a proposal package “fit for a fairytale ending.” It includes exclusive use of the romantic cupola for one hour, a host that escorts the couple to the cupola (23 stories up), a bottle of Dom Perignon, a flower petal walkway into the private space, and a backup private dining room in the hotel just in case the weather proves uncooperative. You&apos;ll find all the romance at 85 East Wacker Drive at North Michigan Avenue. 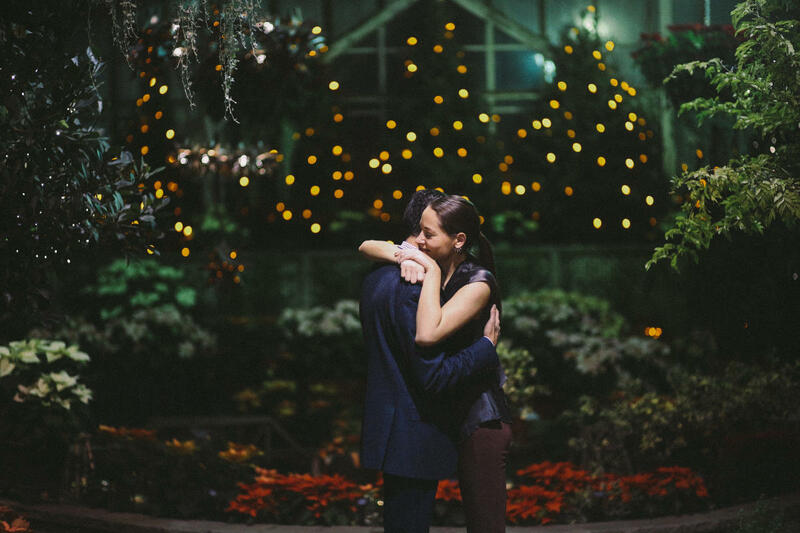 I may be just a little bit biased, because this is where my husband proposed to me, but I have to say, the Lincoln Park Conservatory Show House offers the most beautiful backdrop for a wedding proposal. The Show House changes with the seasons, and is the darling of the conservatory. Pro tip: Go around closing time so you can escape the crowds. If you are lucky like we were, your engagement may turn serendipitous — a wedding photographer was leisurely taking photos of the flowers nearby and captured our special moment for us. Lincoln Park Conservatory is located at 2391 N Stockton Dr, right next door to the Lincoln Park Zoo. For adventurers and thrill seekers, a flight with Vertiport or Chicago Helicopter Experience (CHE) is pretty much tailor-made. Incredible views of skyscrapers and the lake, champagne, chocolates, and a video so you can replay the once-in-a-lifetime experience are among the things that make this so unique. 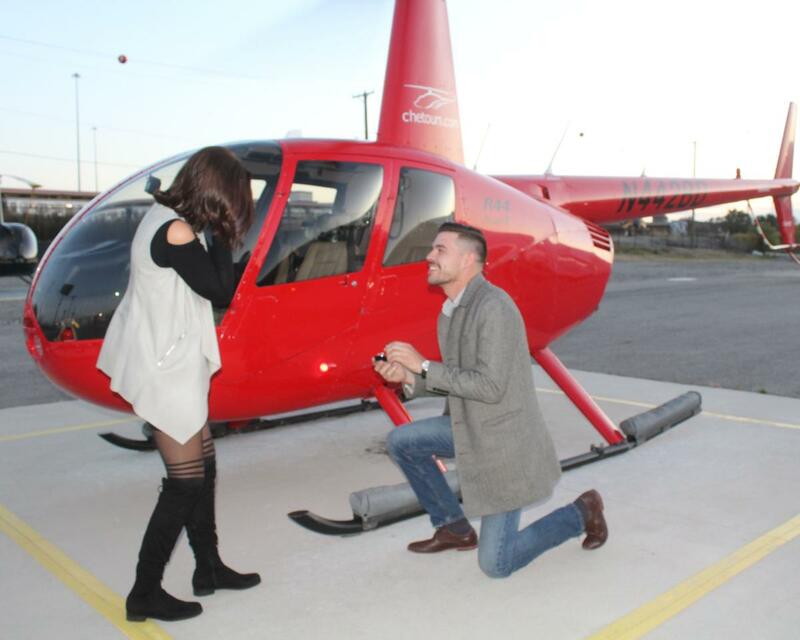 “We love being able to be a part of someone’s special moment,” says Samantha O&apos;Toole, CHE Marketing Associate. “Just call ahead and we can help plan all of the details.” For something extra special, take flight at night. The lights shine just as brightly as that diamond ring you&apos;re hiding in your pocket. This isn&apos;t just any Ferris wheel ride. Not only are you at Navy Pier, one of Chicago&apos;s most popular attractions with views over Lake Michigan, but, with a special ticket package, you get to pop the question inside the VIP gondola, which includes luxurious seats, unique views through a glass bottom, and champagne. “Navy Pier has seen many proposals throughout the course of its history. With unparalleled views of the city and lake, it’s often considered an ideal site for proposals,” says Payal Patel, Navy Pier spokesperson. This isn&apos;t for the faint-hearted, however. The wheel reaches nearly 200 feet in the air, which makes for some spectacular glass-bottom views. 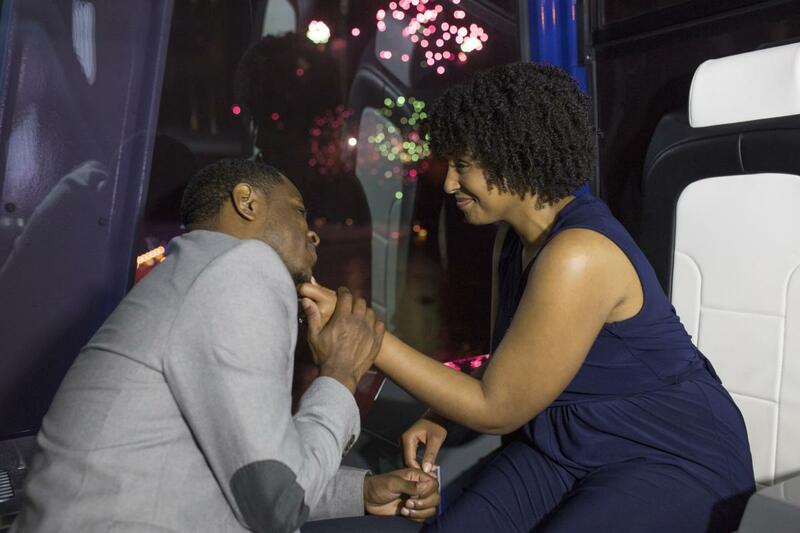 Did you get engaged in Chicago? I&apos;d love to hear your proposal story! Share your story in the comments below.